Another year, another Rose Bowl. Those are the hopes of Badger fans as the 2012 season gets set to kickoff this weekend. While Russell Wilson has left to lead the Seahawks to greener pastures, another highly touted ACC transfer has arrived on campus to shore up the offense as the Badgers return a strong team that lost few players from last season. Wisconsin football is now synonymous with a pro-style power running game. Save for fullback Brady Ewing, the entire offensive backfield returns from 2011. The group is stronger than 2011 as key players have more experience under their belt and Melvin Gordon has emerged as a viable 3rd option and a future star for this football team. Wisconsin’s ground game will be as strong as ever keeping the Badgers in every game they play this season. Rob Havenstein is one fifth of another strong Badger offensive line. Leading the way for Montee Ball and company is another cornerstone of the Badger brand: elite offensive linemen. Despite losing 3 solid to exceptional starters from the line last year the Badgers will do what they always do: reload and march out to battle. Ricky Wagner and Rob Havenstein will anchor the tackle position while the line imposes their will on their opponents. Offensive production will not lack as a result of the line’s effectiveness. 2012 might be the strongest combination of offensive line and running backs since the Alvarez/Bielema era. That is saying a lot. The two most valuable assets on the defensive side of the ball return as well. Mike Taylor and Chris Borland return at linebacker as tackling machines that clog up the field. Chris Borland’s shoulder is also fully recovered from past surgeries and should be used more in a pass rushing role as he was in 2009. If he can be as disruptive as he was as a freshman he could boost a moribund pass rush from 2011. Nearly all elite football teams have exceptional defenses. Exceptional defenses all have impactful defensive lines. Last year’s team was not strong up front and come into this season with many of the same questions. David Gilbert should provide much needed speed from the edge and coaches have sung the praises of Beau Allen throughout fall camp. However, until this unit can be a force in game situations, the defense will continue to struggle against top tier talent as they did in 2011. Jeff Duckworth and others will need more catches like this to power the Badger passing game. Offensively, the Badgers are an injury to Jared Abbrederis away from little to no game experience at wide receiver. Starting opposite Abbrederis is redshirt freshman Jordan Fredrick who looks to be of a similar mold to Abbrederis. While a bit bigger and potentially more physical player, Fredrick doesn’t look to be a player to stretch defenses with his speed. Someone will need to step forward as a playmaker to stretch defenses if this offense is to stay amongst the elite. Despite opportunities no one in the group has emerged to fill that role thus far. Arguably the most critical part of preventing an offensive backslide will be managing new coach transitions. Coach Bielema has more first year coaches on his staff than returning ones. This disturbing lack of continuity – especially on offense – will be hard to overcome. 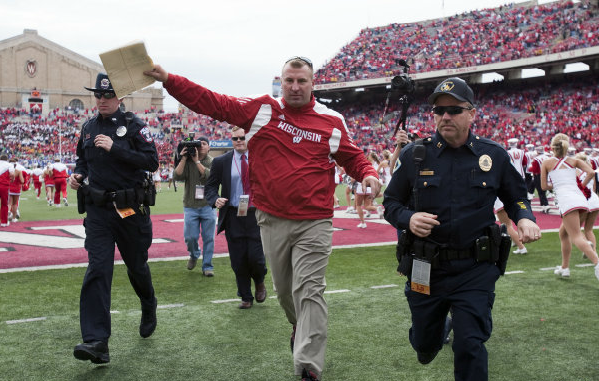 Preventing a decline from the offensive juggernaut that was the Paul Chryst-led offense of recent seasons will be Bielema’s greatest challenge for 2012. The Badgers are not a perfect team. While Heisman front-runner Montee Ball will continue to produce, there are plenty of questions on this team. There are questions at offensive skill positions. There are questions on defense. A new coaching staff and quarterback are being broken in. 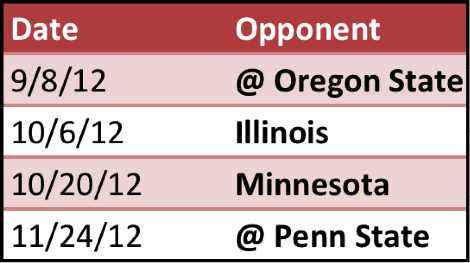 However, despite this the schedule sets up quite well for the Badgers. Wisconsin has some overmatched opponents on their schedule in the non-conference slate as usual. FCS opponent (was 1-AA really all that bad?) Northern Iowa opens the season with a freshman quarterback as their announced starter. Good luck with that. Utah State took Auburn to the wire to open the season last year (a great game if you missed it) but the Badgers have a habit of beating up on teams that they are supposed to. UTEP went 5-7 last year against mediocre opposition and doesn’t look much improved for 2012. Indiana, despite what Kevin Wilson will say otherwise, is still Indiana. The Badgers will be 4-0 in these games. The Badgers have 4 more games that they should win if they play a sound football game. Hold onto the football and avoid giving up too many big plays. Do this and they should come out victorious. After last year’s embarrassment (35-0 sounds closer than the game really was), Oregon State returns most key starters but there is still a talent gap between the Badgers and their hosts in Corvallis that will be hard for them to overcome. Wisconsin should come away with a comfortable win. Illinois has been talked up quite a bit coming into the season as Ron Zook has a habit of recruiting great players and then getting fired, but the trip to Camp Randall should be too much for them. If this were in Champaign it would be a much different game. Jerry Kill may get the Gophers to a bowl this year but he’s still sifting through the carnage of the Tim Brewster Era. By season’s end Penn State will have severe depth issues due to injury and will have a hard time keeping pace with any conference opponent. The Badgers will be 4-0 or 3-1 in these games. Wisconsin has two closely matched opponents on the schedule. Purdue is another team that returns a lot of its roster and should be improved. This game would be in the “Opponent Can’t Win” category if it were played in Camp Randall but Purdue hosts the Badgers in West Lafayette and should pose a strong challenge. If the Boilermakers can execute well and limit mistakes, Wisconsin can be beaten. Michigan State is playing in Madison. If this were played in East Lansing this game would be slotted into the “Toss Up” category. MSU will bring their NFL caliber defense but home field advantage and the Badger ground game should eventually wear them down. Badgers should win a close one at home. The Badgers should be 1-1 or 2-0 in these games. The two real challenges on the Badger schedule come on their conference opener against Nebraska and their November matchup with Ohio State. Nebraska and Taylor Martinez (all-conference shot putter) want to avenge their humiliation from 2011 and have their own fans to help root them to victory. Wisconsin will need to again make the Cornhuskers one dimensional. 2011’s game was the defenses’ best performance. They will need to replicate it if they want to win in Lincoln. Urban Meyer has a lot to like in Columbus. OSU has a stellar defensive line and a fast quarterback with a year’s experience under his belt. If the Badgers can beat Nebraska and the Buckeyes can get the best of Michigan State on the road there is a chance for a meeting of two unbeaten teams. Meyer will have his offense running full tilt by mid-November and with a post season ban every game is their bowl game. Wisconsin will need Camp Randall to help tilt the scales in their favor. This will be the toughest game of the year. Not much of a prediction is it? The Badger regular season will be somewhere between 12-0 and 8-4 isn’t exactly sticking your neck out. The reality is the Badgers are a very good football team. Bret Bielema said the loss of Devin Smith last year cost Wisconsin a shot at the National Title. That isn’t accurate. J.J. Watt leaving for the NFL was the nail in that casket. If they had a legitimate pass rush they would not have played a close game going into the National Championship. Are they a dark horse National Title contender for 2012 as some have said? That is a VERY remote possibility that requires a lot of luck given the weakness this team continues to have up front on defense. If someone on the defensive line can emerge as a 2nd threat next to David Gilbert – who we are already putting a lot of stock in based on a small body of work against mediocre opponents – and the offense can maintain it’s mojo with all these new faces catching passes and calling plays there might be something here. More than likely, however, this is a 10-2 football team that earns a return trip to Indianapolis to face Michigan, Nebraska, or Michigan State. They stand a fair shot against any of those teams (my personal preference being Michigan because of their lack of depth up front on defense…that and I really enjoy watching Michigan lose!) and making a 3rd trip to Pasadena. On the low end the Badgers stumble in big games and get surprised once or twice but find their way to a Gator or Outback Bowl. Bret Bielema has a chance to elipse his predecessor with continued success in the coming seasons. This team stands at the edge. Barry Alvarez spent 16 seasons building the Wisconsin brand. Bret Bielema took the foundations that his boss put in place and has elevated the program to a prominence never seen before. To put it bluntly these ARE the good old days. Wisconsin has a home winning streak spanning multiple seasons. Visibility and media coverage of the program is as positive as it’ ever been. Most notably Wisconsin is emerging as a destination for quarterbacks. This is the program that had Mike Samuel as a 3 year starter with more career INTs than TDs. Things have come a long LONG way in a dozen seasons. If the Badgers can have a truly special season: a lucky bounce of the ball, a shoestring catch, an opponent’s missed tackle, then this team, imperfections and all, could be one to take Wisconsin football to that elite level they are trying so hard to reach. Are they as talented as the 2011 squad? Probably not. But all they really need to be is a little luckier. Posted in Past Seasons and tagged with Russell Wilson. August 29, 2012 by Buckaround.